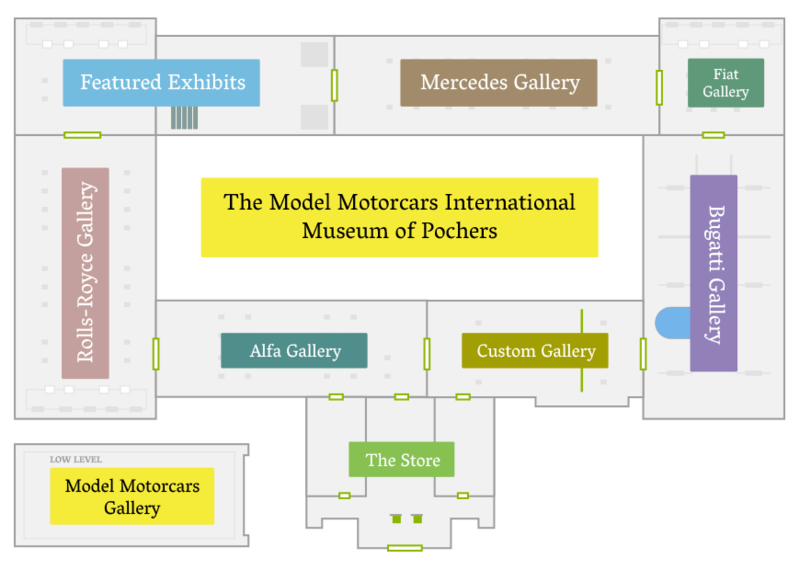 Pocher Museum of Fiat, Bugatti, Alfa, Rolls-Royce - Model Motorcars, Ltd.
To view this incredible Pocher collection, click anywhere inside the gallery area in the museum floor plan below. Be sure to check out our newest gallery – Featured Exhibits – where we showcase models that represent the highest level achievement in scale model building. The galleries in the lower level are devoted to the Models of Model Motorcars while Our Store provides all the Parts, Books, CDs and Tools you need to enhance your Pocher building experience and make it both a joy and a success. Thank you for visiting the museum and we hope you enjoy your tour. Mercedes chose the 1934 Paris Auto Show to debut their new flagship – the 5.4 litre supercharged 540K. Along with the 500K introduced two years earlier, this 17 foot long machine bodied by Mercedes in-house Karroserie at Sindelfingen cost over $10,000 when new and, today, they hammer home at over $10,000,000! Beautiful and powerful, the 500 and 540K are in a class of motorcar unto themselves. 1931 Alfa Romeo. Vittorio Jano. The time, the team and the man combined to create the greatest racing and touring car ever taken to the road. With its magnificent straight 8 up front and the coachwork of the finest corrosier of the day, the 8C is power, beauty and elegance supreme. Launching Italy into the winner’s circle and the careers of Jano and a young mechanic named Enzo Ferrari, these Alfa teams and their incredible 8C2300 are still one of the greatest circuit racing teams and machines in the history of motorsport. Some of them have multiple engines while others sport body designs that are truly unique. From the mildly modified to the full-on one-of-a-kind, every model in the Customs Gallery is an incredible creation born in the imaginations of very creative and courageous Pocher builders. Conceived as the coupe version of the Bugatti Type 46, the Type 50 was an impressive Grand Tourer getting an impressive 225 horsepower out of its straight eight engine. Sixty-five of these gorgeous motorcars left Molsheim between 1930 and 1934 and today they are among the most beautiful cars in the world. They were the pride of Jean and Ettore and, today, we are proud to display the most beautiful scale replicas of this amazing car here in the Model Motorcars International Museum of Pochers. Click the buttons below to begin your tour. In 1929 Henry Rolls and Charles Royce replaced the venerable Phantom I with the 7.7 litre, six cylinder Phantom II. Many collectors consider this PII to be the most beautiful and impressive Royce in the Phantom line. Whether configured as an open touring car or as a closed coupe, the second Phantom is certainly one of the most beautiful and enduring cars in the line of The Best Motorcars In The World. Here in the International Museum of Pochers we feature some of the most beautiful scale recreations of this magnificent motorcar.